What if I Told You That You Would Have a Higher Value Social Circle, Massive Opportunities in Your Lap, And a More Epic Life in Just 8 Weeks? Having a flawless strategy for approaching new people and a format for directing conversations, so you confidently build ties with people of value… no matter what level of experience you have. Discovering how to position yourself so that people will want to connect with YOU before you even have to approach them. Transforming yourself into a higher-level master at building the social circle of your choosing while having influence and respect as a person of massive value. The answer is his social capital. 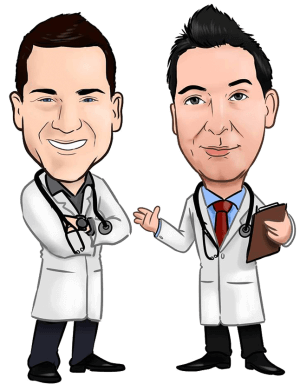 Dr. Smith is perceived as a family doctor, and Dr. Isaac Jones is perceived as a doctor that has worked with top athletes, entrepreneurs, and famous celebrities. People look to Dr. Isaac Jones as someone that must know more about health and wellness than other doctors, based on how many people choose him over their primary care doctors – amazing right? Dr. Isaac invested in building his value to others from the beginning. He is the perfect example of someone that not only mastered his skillset (in health and wellness) but also in his value to others through special actions like we’ll show you below. Social capital development is the one way that you’ll have more confidence in building relationships, having more opportunities coming to you, and living a more fulfilled life because you’re not struggling so much to be relevant. HERE’S YOUR PERSONAL GUIDE TO HAVING AN INCREDIBLE SKILL SET FOR BUILDING A STRONG SOCIAL CIRCLE AND PROVIDING VALUE TO THOSE IN YOUR LIFE LIKE NEVER BEFORE. After you complete the Social Capital Networking Intensive, you’ll have developed the skills and confidence to walk into any room and walk out with new relationships. You’re going to strengthen your value as a person by forming bonds with people across all areas of life that lead you into once-in-a-lifetime opportunities. 10 Week Training – It’s an easy-to-follow, 8-unit Intensive delivered over ten weeks. Accessible Everywhere – The Intensive is an online program that is accessible anywhere. 32 Trainings – It includes 32 training sessions and bi-weekly exclusive question-and-answer audio sessions. Video and Audio – Each session includes video and audio training, as well as workbooks to ensure that all aspects of the Intensive are covered, helping you master these epic systems. All Downloadable – Training materials are easy, simple downloads. Mentoring Year Round – Training materials are easy, simple downloads. How to represent yourself to your current inner circle. 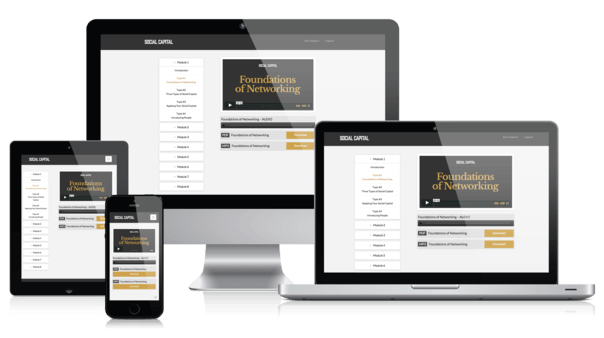 You’ll get our Foundations of Networking step-by-step process for developing the skills to strengthen and maintain relationships. You’ll learn how to understand and keep track of the value of our 2-way bonds with important people. You’ll learn how to be a great relationship-builder instead of a “networker”. You’ll see how to build your social capital asset by creating and delivering what’s valuable to others – and realize how that gives your life more essential power. You’ll discover the right questions to ask at exclusive, high-profile events. You’ll figure out how to tap into your confidence by introducing other people to each other using our double opt-in strategy. You’ll receive our guide for taking inventory of the best qualities you have in engaging others – and how to activate them every time. You’ll gain an important way of thinking about how to communicate. You’ll see how to engage with high-profile people in a way that feels good. You will learn creative ways to follow up with important contacts in a way that forms lasting alliances. You will learn to utilize the abilities to create new and exciting connections with higher-quality people. You will take a higher leadership position in the eyes of these new people of value. You will get our guide for integrating what you love about your top influencers’ approaches to life into your own. You’ll have more of what it takes to connect with people and demonstrate killer listening and communication skills. You’ll learn how to develop your ambition into a strategy that help you achieve your goals in life. Anything that’s kept you back won’t any longer. We’ll show you how to integrate your new abilities into your daily and weekly schedule. You’ll find your “ideal interaction lifestyle” by taking inventory of your strongest qualities and then seeing how to highlight them in every introduction. You will learn more ways to seize opportunities without coming off as needy. You’ll learn how to connect deeply with your network every year, without total overwhelm. You’ll learn how to sustain rapport over time with your following. You’ll learn how to make the most impact with your daily, weekly, and monthly online engagement. You’ll learn the different ways your relationships can go downhill and how to prevent them from happening. You will learn about human bias and how you may be damaging your network without even knowing it. You’ll learn by hearing how the most successful relationship-builders get themselves out of the most intimidating high-profile individual problems. You’ll be utterly and completely clear on how to fix pitfalls in the future. You’ll learn about the fundamentals of building your reputation and creating a personal brand that matters — to you and to the world. You’ll discover what it takes to make your personal brand thrive in the digital age by way of thought leadership and the Social Capital Strategy. You’ll be given the tools to reconcile your offline and online personas, live up to your personal brand, and amplify awareness of your brand to the world. You’ll understand how everything we’ve learned up to this point ties together: the end game of networking, the larger benefits of strong relationships, and how to create a permanent lifestyle around networking. You’ll find out how to create a lifestyle that nurtures the social capital you’ve built and perpetuates its influence over your connections and the resources they provide..
You’ll finer hone your network to include an inner circle of trusted friends and partners — and learn to recognize the valuable opportunities that organically spring from this circle.